Weve already seen that the browns actually are intermediate between reddish oranges and black. It means that if an orange is 255-128-0 (= red 100%, green 50% and blue 0%), and if you reduce to 75% then 50% its luminous power, it becomes 192-96-0 then 128-64-0, which are browns. You can continue on the same way with 64-32-0, 32-16-0 and finally 0-0-0, which is black. Figure #17 shows the same color 207-94-0 in both circles. But in the black square it looks like an orange, and in the white one like a brown. Its the same thing if you look at a brown piece of furniture through a black tube: itll seem not to be brown but orange! Figure #18 demonstrates the gradation from 4 oranges to 4 browns, their brightness going (starting at the bottom) from 100% to 80%, 60% and 40%  for example, the first orange goes from 253-190-0 to 191-143-0, then 128-96-0 and finally 81-61-0. This figure also illustrates the fact that reddish oranges give true browns and that the more yellowish the orange, the more greenish the brown will be. Figure #19 is another example of 3 oranges turning to 3 browns when their brightness lessens. The first column shows 4 neutral grays of the same intensity as the one of the orange/browns on the same line. As you can see on the image below, the same thing is true with material pigments. But intermediate colors between pure saturated browns and grey do exist too  saturated browns means red an green lights without blue, thus the third number is 0 (zero). These are grayish browns and brownish grays: it means they contain a little blue light. Figure #20 demonstrates how browns can become grays gradually. The last column shows 4 saturated browns (without blue light: their formulas are 102-51-0, 128-63-0, 191-80-0 and 191-95-0). Going from right to left, by adding more and more blue, they become more and more grayish to finish as pure greys in the first column. The results would be the same when mixing neutral grays with pure browns. Its interesting to compare the arithmetic progression of the blue light (0-25-50-75-100) to the simultaneous degression of the red one (200-175-150-125-100). Perhaps this can explain to a certain extent why an easy way (maybe the best!) 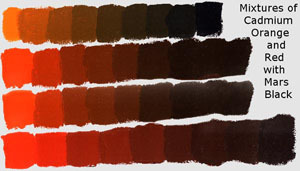 for making good grays and blacks when painting in oils is to mix together browns (or oranges) and blues. For example, you start from Cadmium Orange and Cobalt Blue to arrive to Burnt Sienna and Indanthrene Blue. Try it, its a very exciting exercize! Next section will examine which colors a painter uses most frequently.